Apparently, or so I found out recently, there is some antagonism between authors publishing in e-print format and those in hard copy. I never knew. Where did I discover this you ask? When an author with a traditional paper contract blasted other authors for referring to hard copy editions as “dead tree” or “legacy” formats. Evidently those authors using this terminology are disparaging and demeaning the hardcopy editions. For myself, I thought this was all rather silly. I don’t really like the term “legacy format” but am quite happy to use “dead tree format.” I see it as a term of endearment. To be honest, I'm not sure I will be truly comfortable calling myself an author until I have a paper copy in my hot hands. Yet I am really excited about the possibilities that the digital age is reaching new readers. I have a friend who was skeptical about eBooks. She acquired a Kindle and is now buying cheap eBooks from authors she otherwise would never have tried. Indeed she's finding it difficult to read her paperbacks. I also love the way the digital world is re-entrenching the audio tradition of storytelling. No longer are audiobooks overly expensive after thoughts provided only for the visually impaired. In the end though arguing over format is unimportant and misses the best point. What is important is that our stories, our imaginings are making their way out into the world. Isn’t it in the end, all for the love of a good story? From our author, Alma Alexander, reprinted with permission from her blog. 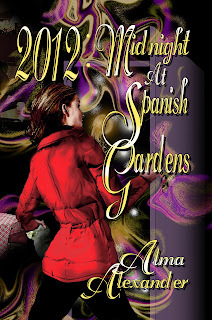 She is the author of the upcoming novel, 2012: Midnight at Spanish Gardens. I don't generally enjoy those "let's-all-go-in-a-clump" group excursions to anywhere. I tend to be a private person who doesn't do well with enforced gregariousness for very long. But hey, there you have a situation - I had an opportunity to go to Scotland, which was a place I'd always wanted to visit, and there was a tour which would take me around the highlights of the place without me having to meticulously plan out or nail down an itinerary myself, and I didn't have a lot of time anyway, so yea, verily, there I was, sitting on a tour bus trundling through the Highlands, together with (amongst others) a bunch of loud American tourists who wore awful clothes (I kid you not, a pair of red and white checked trousers at one point, I think the guy thought that he was either on a gigantic golf course and just dreaming the rest of us or thought he was wearing TARTAN and honouring his hosts...) and had obnoxious spoiled children called things like Chuck and Mary Lou with whom communications always seemed to be at full volume and for whom we were ALWAYS waiting because they just HAD to go back and use the restrooms in a place or else lingered in a gift shop fifteen minutes after everybody else was ready to leave. In other words, picture this: tour bus, full of squabbling kids and adults talking about vastly irrelevant things or squealing wildly when the guide, chattering patiently into a microphone up front, pointed out something that sounded Scottish, like "Loch to your left". Hardly the situation or the place or the time to get all new-agey and mystical about things. One of the spots the bus stopped to disgorge us was a place named Culloden. If you know anything about your Scottish history at all, this name will ring a dolorous bell. It was the site of a battle between the Highlanders and the British army - no, hardly a battle, make it a slaughter. If you read accounts of it you will find grisly facts like the tidbit that there were so many dead bodies strewn on the field, after, that there was no way that they could all be buried individually - so they were sorted according to Clan, by the tartan that they wore, and buried in mass graves over which a stone was raised with their clan name on it. So you have grave markers that say simply Clan Cameron, or Clan MacDonald, with who knows how many souls laid beneath the ground at their feet. When we heaved into the gravelled parking lot of the visitors' centre at Culloden, the place seemed suited in some respects to the loud and "where's-the-souvenir-shop" crowd from the back of the bus. To be perfectly honest, it was unprepossessing - a low modern building crafted for utility rather than beauty or atmosphere, it had an audio-visual theatre inside where you could take in a presentation about the place and its history, a display area with gory woodcuts depicting death and destruction beside data cards detailing times and dates and the course of the battle as it unfolded, and, yes, the inevitable souvenir shop at the exit, selling trinkets to remember Culloden by. None of these things held any interest for me, really. What I was drawn to, getting off the bus, was the edge of the parking lot. It was divided from an open field by a low wooden barrier, a single bar at maybe shin- or knee-height which marked the border between the crass and the modern and the workaday and that which lay beyond, that field, so innocent, so green... and all that it meant. I walked across the parking lot with gravel crunching at my feet and distant birdsong somewhere above me in the blue sky. A gap in the fence marked the beginning of a path across the field, over to a hillock where I could see the grave markers standing. I came to the fence. I crossed the gap, and took a step into the field. The light changed. The birdsong vanished. All I could hear was whispers, whispers, whispers - all around me - and beyond them all was silence, in that strange flat yellow light. My feet carried me through this, more by the mechanics of simply putting one foot in front of the other and keeping on moving forward, until they brought me to the hillock where a rock stood, surrounded by granite headstones carved with fading names. Clan Cameron. Clan Macdonald. Clan MacGregor. I stood there, in the silence, in the whispers, in the presence of ghosts, and wept. They wanted to know, afterwards, at the bus, if I was okay, with the streaks of tears evident on my cheeks. I said I was fine, and wished they would all go away. That night we stayed at a cheerful inn with tartan carpets and stag heads on the wall, and were treated to a full Highland Ceilidh - which I actually thoroughly enjoyed - but during a pause in the music presentation another woman from the bus and I got to talking to one of the pipers, and she began to tittup about how she had really enjoyed the visit to Culloden, and how it had all been so brought to life for her, and how she could "just see" all those tartan-clad young men with their claymores waiting for the redcoats to come. The piper looked at her with an indulgent and somewhat world-weary smile - he had probably heard this story before. "You, madam, are a romantic," he told her. She took it as a compliment, and flushed prettily. "And what about me, then?" I said. "I couldn't see them, but I could hear them, whispering all around me - them, and no birds and no wind in the trees, just the voices of those who are still there, who never went away, who never can..."
The way he looked at me, as I said this, was very different than the way he had looked at the "romantic" lady, who had ceased to giggle and flirt and just stared at me with blank incomprehension. "You," said the piper, "are a mystic." He didn't say any more. He seemed embarrassed, in a way, that he had said that much. But I kind of got the message that it was easy enough to lull yourself into seeing the brave batallions squaring off against one another - but that few people had been given the privilege of hearing them speak (in whatever manner it was left for them to do so) or to sense their REAL presence in that haunted field. I honestly don't remember how I got out of the field, and back to the bus. It might have been well-meaning fellow tourists who led me back across the sward onto the gravel, where I could re-join the hustle and bustle of our own world. Or maybe it was the ghosts from beyond the Veil, who took me by the elbow and guided me back from the edge of the Blessed Realm whispering all the while, "Go back. Go back. It is not yet your time." I wonder, sometimes, if that much death weighs heavily enough on the Veil to make it porous, to make it eaier to reach through and touch and sense and hear and understand. Culloden remains the only battlefield of its level of historical fame and repute that I have ever been near; I do wonder sometimes if I would have the same experience if I walked on the fields of Gettysburg, or the ground where they filled in the once-trenches of the Somme and of Passchendaele. There is something in me that is deeply afraid of finding that out.